Expect an extended closure for this EB event at MM259. 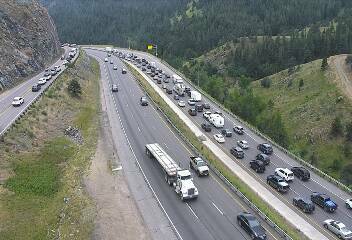 Alternate routes are Hwy 40, US 6 or Hwy 74 through Evergreen then down to C-470. Closed due to major crash. There is no estimated time of reopening. Alternate Routes available: US 6 or CO 74. UPDATE- EB I-70. Up to 3 hours total travel time from Silverthorne to Denver/C-470, MM 205-259. Alternate routes advised- US 6, CO 74 or CO 9 south to US 285 from Frisco. Extended closure. 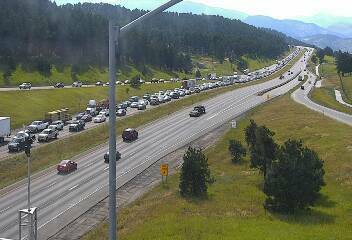 A current view from the Genesee ramp on I-70, looking west at EB traffic. OPEN EB I-70 at Morrison MM 259, following crash clean up. Heavy traffic remains. Expect up to 3 hours total travel time from Silverthorne to Denver C470.